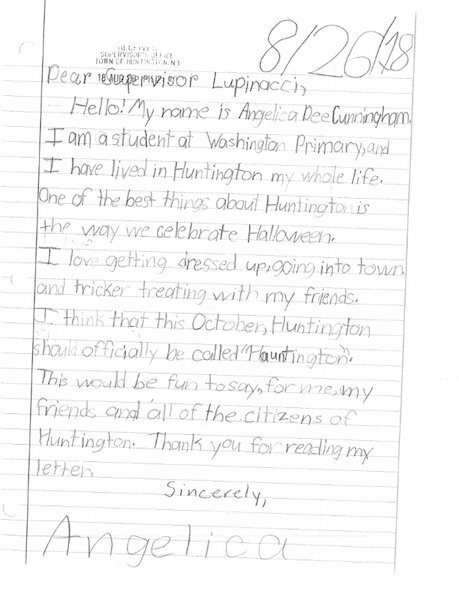 You may know it as the Town of Huntington, but on Halloween it’s officially known as ‘Hauntington.’ This is thanks for 7-year-old resident of Huntington, Angelica Dee Cunningham. Cunningham wrote a letter to Huntington Town Supervisor Chad Lupinacci with the idea to change the Town’s name to “Hauntington,” and Lupinacci agreed! On the Tuesday (the day before Halloween), the Town Board renamed the Town of Huntington to the Town of Hauntington. Let us know in the comments below how do you like the new name!